Esbern resided in the depths of the Ratway underneath Riften. Lydia and I traveled to Riften recently in search of Esbern, probably the only other living member of the Blades. 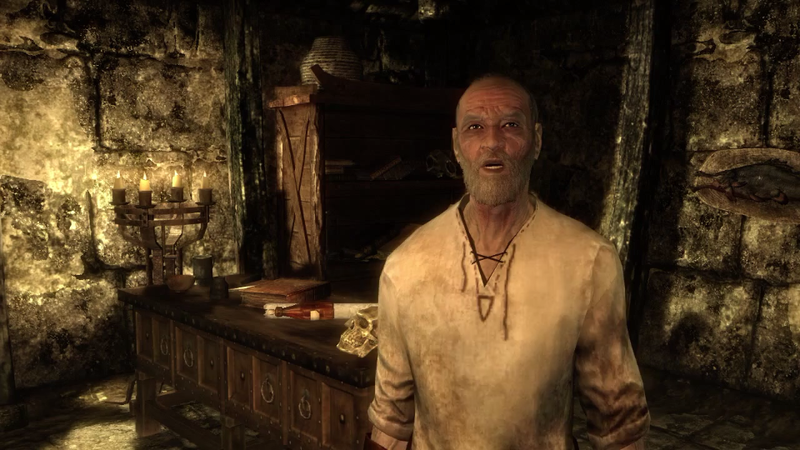 The prisoner I freed from the Thalmor Embassy told me to speak with Brynjolf, a man I’ve spoken with before. When I spoke with Brynjolf weeks ago, he led on that he was a member of the Thieves Guild. Before I could get him to spill the beans on Esbern’s location he wanted me to show the Thieves Guild a little consideration. Brynjolf sold drinks in the shopping center of Riften, and he wanted me to set up another vendor, Brand-Shei. Brand-Shei crossed paths with the Thieves Guild in an unfortunate manner (I can’t remember why he was being set up) and Brynjolf assured me that the only punishment Brand-Shei would receive was a few days in a prison cell. I was to plant a ring belonging to another vendor (an Argonian named Madesi who I’ve fetched gems for) on Brand-Shei. To get Madesi’s ring I needed to break into a lockbox in his stall. Brynjolf created a distraction claiming magnificent benefits from the drink he was selling at which point I stole the ring and planted it on Brand-Shei. A few minutes later, Brand-Shei’s “thievery” was uncovered and he was taken away. Brynjolf was pleased with my act and disclosed that Esbern was in fact alive and was living in the depths of the Ratway underneath Riften. As Lydia and I breached the Ratway we fought many homeless residents and met many members of the Thieves Guild in an underground tavern. Among a group of mentally unstable residents we found Esbern. We talked a little and left for Riverwood to meet back up with Delphine. While leaving the Ratway, groups of Thalmor attacked us but Esbern showed off his magical prowess and took care of the threat nearly single-handedly. Once back in Riverwood Delphine and Esbern caught up slightly before moving onto the task at hand: stamping out the dragons in Skyrim. Esbern didn’t have any immediate plans but spoke of Alduin’s Wall. He told is about the ancient wall that accounts the rise of the original dragonborn. Esbern believed we might find clues on this relief. Sleigh Bells continue bringing the noise on Reign of Terror. A band I find really interesting put out a new album last week and I picked it up right away. 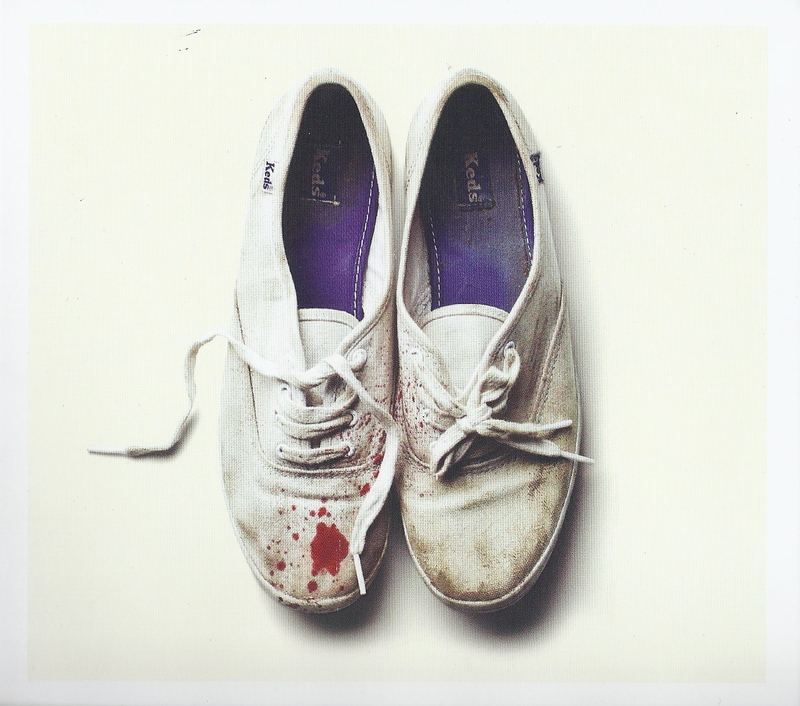 Sleigh Bells’ Reign of Terror is similar to their previous album, Treats, in that it’s deafening, but different because the songs are more traditionally structured. Their songs rely heavily on guitar, and I mean that in a metal sense; when I saw them in concert last year they had stacks of amps and the amplification is key to their sound. Another key element to their sound is a heavy use of beats, that when combined with other unfriendly sounds to ears creates gigantic and immense walls of sounds, often times briefly – representing the drums in most cases. That’s Derek Miller, and really that’s only one half of Sleigh Bells. Alexis Krauss is the other half and she brings the vocals. She seems to “sing” more often on this album, and that’s a welcome change. Like I said previously, their songs are more structured this time around with familiar elements to pop songs and that’s thanks to Alexis’ background in pop music. I know little about song structure and am a simpleton however and just like the sounds and sometimes a handful of lyrics that I find fun to sing. I haven’t spent enough time with the album to parse out the songs too well. My favorite song is “Comeback Kid” because of the underdog mentality of the lyrics, as well as the flow of the song. Another favorite of mine is “Born to Lose” in which Alexis shows brutal apathy for someone who gives up on life easily. It’s a really interesting combination of the most intense and heavy guitar shreds, production heavy beats, and a pop female vocalist that still entertains me and demands to be played at obnoxious levels, especially at stop lights and in parking lots. 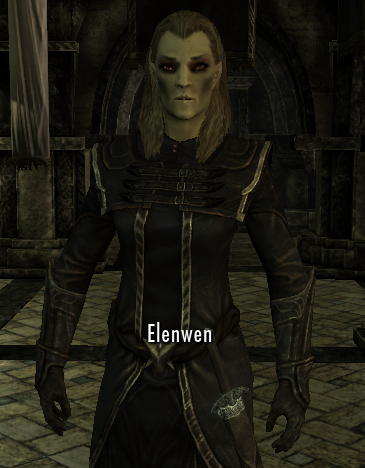 Elenwen, an Altmer (high elf) and ranking member of the Thalmor. When I last spoke with Delphine, she believed the Thalmor were somehow involved with the resurrection of dragons in Skyrim. To get more information she wanted me to sneak into the Thalmor embassy and see if I could dig up any related intelligence. Sneaking in was a solo mission so Lydia and I parted ways for a few days. 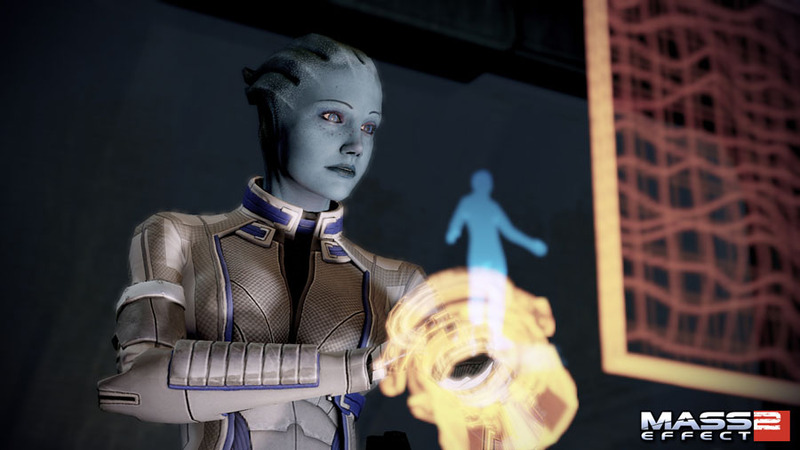 I’ve become so used to her company, it was sort of sad not to have someone by my side in battles. A party was to be held at the Thalmor embassy in the northeastern most area of Skyrim and Delphine not only had a way to get me in, she also had a man on the inside that would be able to sneak my gear in. I traveled to Solitude (also in northeastern Skyrim) and met Malborn, Delphine’s contact in a bar. We had a succinct chat and I gave him necessary equipment: weapons and armor. Although before that meeting, I witnessed an execution. As soon as I entered Solitude, I was taken aback by the hoopla a forming crowd was making. A criminal was being beheaded for opening the gates and letting Ulfric Stormcloak evade capture by Imperial forces, Solitude is aligned with the Imperials after all. There was some dissension from the crowd on whether the punishment fit the crime however. Delphine had a carriage prepared for me at a farm just outside of Solitude and she took the remainder of my gear before sending me off. It was a fairly short trip to the embassy where I had no problems getting in. Another guest was arriving when I was and he smelled strongly of liquor. This soiree was hosted by a high elf named Elenwen who immediately began chatting with me. She recognized that she didn’t recognize me and luckily, Malborn was able to get her attention before she figured anything out. I mingled with other guests and talked with Maven Black-Briar, who hinted at my past and a few other bigwigs from Skyrim including a few high elves. 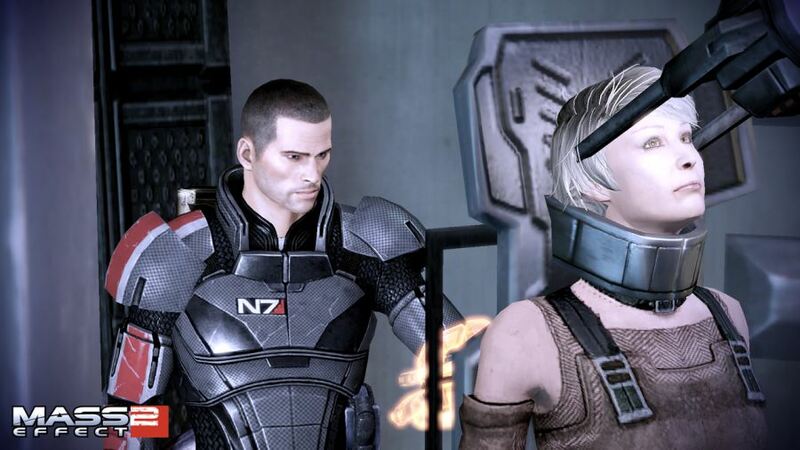 When I spoke with Malborn he needed me to create a distraction before we could leave unnoticed. The guest I arrived with had been cut off from obtaining drinks and I thought it’d be generous of me to get him one. All I asked of him was a distraction. Oblivious to my intentions he arose and made a toast at which point Malborn and I took our leave through the kitchen. Malborn smuggled my goods inside the embassy and they were in a hallway connecting the kitchen to a set of rooms. 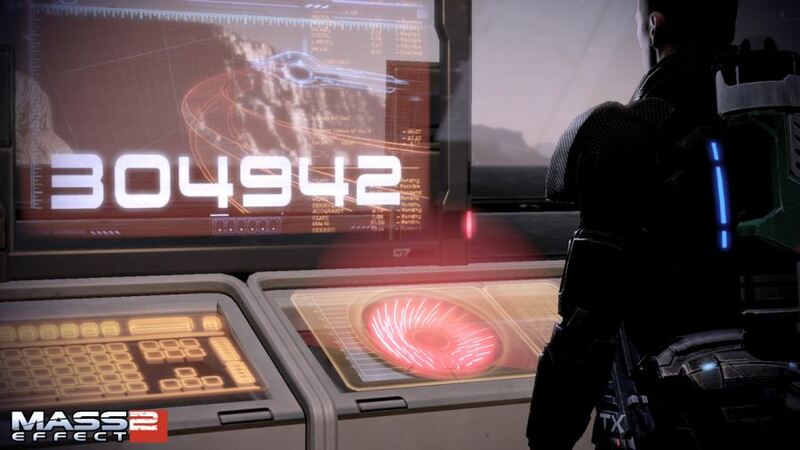 Fully equipped I began making my way through the embassy, avoiding guards if I could and killing the ones I couldn’t. I ventured outside and into another building until I found some evidence. It suggested to me that Thalmor had nothing to do with the dragon’s revival; they were as weary of them as we were. I found this evidence inside a chest along with some documentation on Delphine. Inside this second building was a prison where a prisoner was getting whipped when I entered. The guards didn’t notice me entering and I overheard them asking about an old man. Before they lacerated him too much, I quietly killed these guards and freed the prisoner. We began talking when we were interrupted by a squad of guards with Malborn. I rescued him and we had to take our leave as the high elves were onto us. A hole the guards used to dispose of bodies was our exit and once free, I talked at length with the prisoner. He told us the old man the elves were inquiring about was, like Delphine, a Blade and alongside her, probably the only other one remaining. I met back up with Lydia in Solitude and told her of my espionage on our way back to Riverwood. Delphine was in shock when I told her that another Blade was rumored to be alive. She believed it must be a man named Esbern. The prisoner told me that the high elves believed Esbern had a link to the dragon’s revival and he resided in the deepest sections of the Ratway underneath Riften, our next destination. The Gildergreen, restored to life. 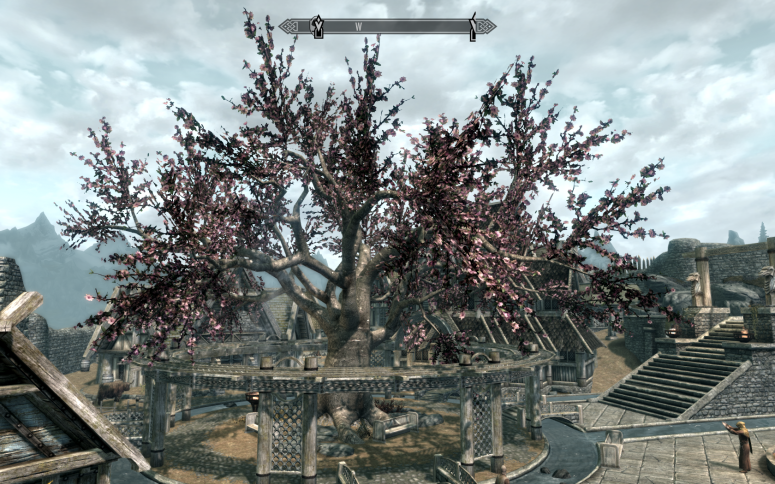 Even though I know I need to head to Solitude in order to sneak into the Thalmor Embassy, I shirked that responsibility and instead aided Danica Pure-Spring in her quest to restore the Gildergreen, an ailing tree within the walls of Whiterun. Danica is a priestess at the Temple of Kynareth in Whiterun and I agreed to help her out ages ago. To restore the Gildergreen, she believes sap from the Eldergleam Tree (an ancient tree blessed by Kynareth herself) is required. 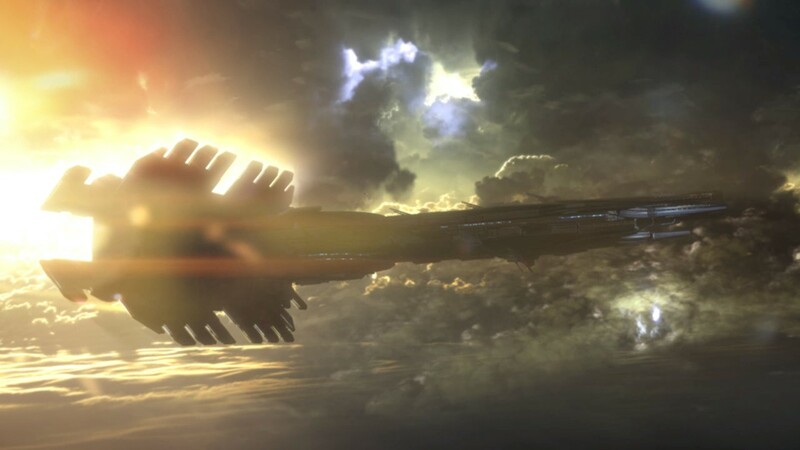 She tasked me with retrieving a mystical dagger that is said to be the only weapon capable of damaging the Eldergleam. When I was in Riverwood, I made the short trip southeast to Orphan Rock, where Danica believed Nettlebane was. Sure enough, a hagraven had in her possession Nettlebane, the mystical dagger I needed. With that in my possession Danica then pointed me to Eldergleam Sanctuary, the cave where the ancient tree grows. The cave was fantastic. A short hallway led into a massive room that looked as though it was eternally spring. Grass was green, flowers were blooming, and a stream was eternally flowing under the magnificence of the massive Eldergleam. There were a few followers of Kynareth inside who asked me not to extract sap from the tree, but I want to beautify Whiterun, and a little less sap won’t destroy the Eldergleam anyways. Roots from the tree were overgrown and prevented access to the base of the tree, but a quick slash with Nettlebane and the roots magically reacted and curled back towards the tree. Once at the base, I slashed the tree and a few Spriggans appeared and began attacking. Unable to rescue the followers of Kynareth, I at least rid the Eldergleam Sanctuary of these beasts before traveling back to Whiterun with sap in my possession. After delivering the sap to Danica, the Gildergreen should begin its transformation back to life soon.